Jacob Tadje is a hard working pre-medical student at the University of Utah with big dreams and a heart of gold. He hopes to become an orthopaedic surgeon like his dad, Dr. Tadje. Last, month, he was sponsored by Tadje Orthopaedics to participate in a humanitarian trip to Senegal. This trip was organized By the University of Utah’s Dr. Richard Ingebretsen, MD, PHD. Dr. Ingebretsen and 7 students spent 5 days in Senegal, and traveled to 4 different villages. The trip was eye-opening. The villages they visited are essentially clusters of huts throughout the savannah. The villages are mostly self-sustaining, and have around 200 people living in each. For many villagers, this was the first time they had spoken to a health professional. Jacob and his team members interviewed each villager to assess needs. They took vitals and treated what they could. They found many people who suffer from joint pain, malnutrition, dehydration, and head fungus. Malnutrition and dehydration are hard to solve long term because of the lack of protein and clean water sources. They were able to teach the people ways to better manage the joint pain, head fungus, and other more minor infirmities. They found some villagers with more serious ailments, like TB, malaria, and skin cancer. They are planning to analyze the data they gathered and find ways to treat these more serious needs in future trips. Jacob’s most rewarding experience was helping a 15-year-old boy with a hearing impairment. He was unable to hear anything farther than approximately 15 meters. Jacob looked at his ears and realized he has some major blockages. After Jacob spent some time irrigating and cleaning out the blockages, the boy’s hearing was completely restored and he was overjoyed. Going to Senegal was rewarding for Jacob and his team members. Jacob left with more gratitude for his way of life, especially access to clean water, a comfortable home, and modern healthcare. Wyatt Lyonsmith has been riding dirt bikes since he was 4 years old. When he was about 8 years old, he saw his first motocross race and was instantly hooked! By the next event, he was no longer an observer, but a racer. Since then, he has raced at all of the the major amateur national events, as well as many local ones. He’s ranked at the top of the amateur class and plans to race professionally within the year. Any day of the week, there’s nothing Wyatt would rather be doing than riding his dirt bike. He enjoys it so much, he chose to complete his last two years of high school online so he could live at a training facility in South Carolina. While there, he was able to train and work out daily with other serious motocross athletes. Since graduating, he’s had the opportunity to travel around and race on many different tracks. Like most other motocross racers, Wyatt has had a few broken bones. He’s gotten through the races safely, but several of his practices have been a bit unlucky! He broke his femur at age 10 and then his wrist and ankle more recently. Dr. Tadje has been pleased for the opportunity to support Wyatt in his racing pursuits for the last 9 years. The whole office is excited to follow Wyatt’s career and cheer him on as he makes the transition to becoming a professional racer. 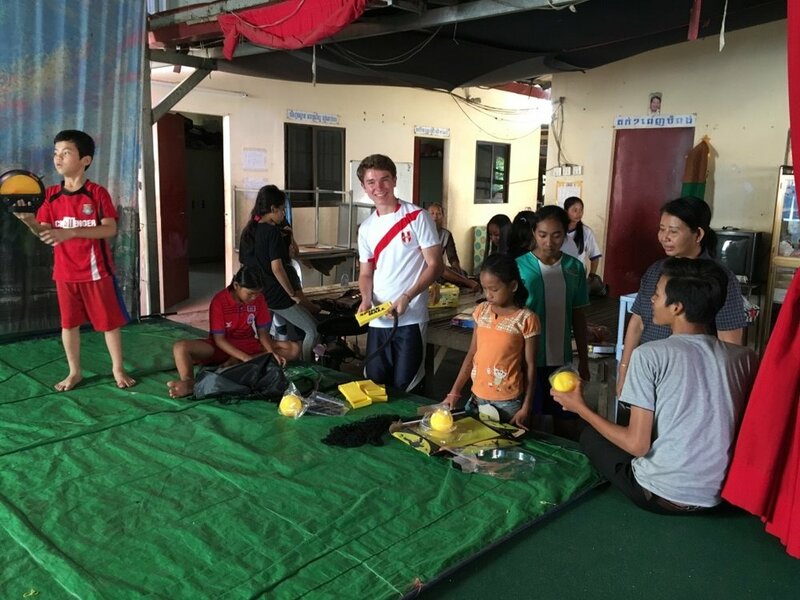 In 2017, Dr. Tadje took a humanitarian trip with his son Andrew, to Phnom Penh, Cambodia. 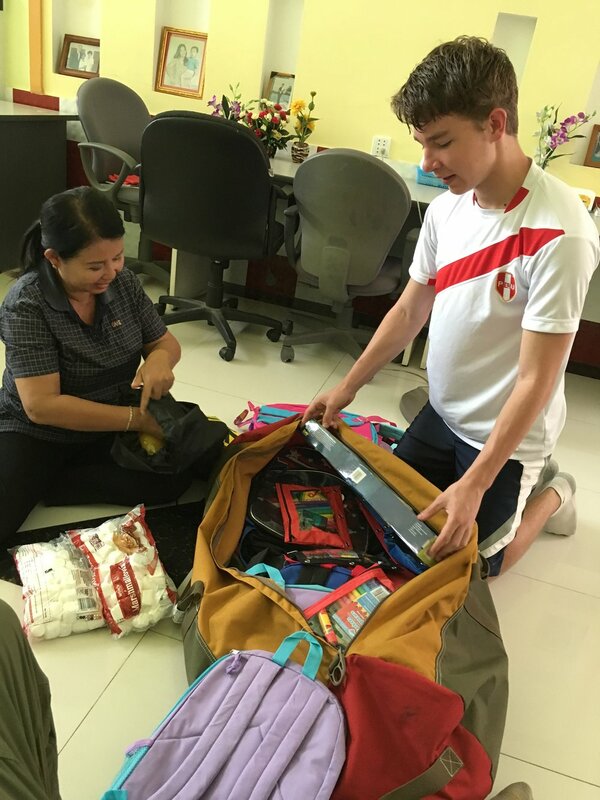 They were able to provide much needed assistance to a place called CICFO (Cambodia International Children Friendship Outreach). CICFO is a home where about 30 children live in a family environment, so they can attend school. The children are accepted through an application process and are able to live in this home until they are finished with their education. An organization called CICFO-USA raises funds to support the needs of the CICFO family. The CICFO children travel occasionally to visit their birth families, but CICFO is their true home. The children live as a family, sharing meals, chores, love, and support. CICFO is an upgrade for the children who are used to living in absolute poverty. However, even at CICFO, the children sleep in unbearable heat, packed together on the ground, owning nothing but the clothes on their backs. Dr. Tadje and his son wanted to help. 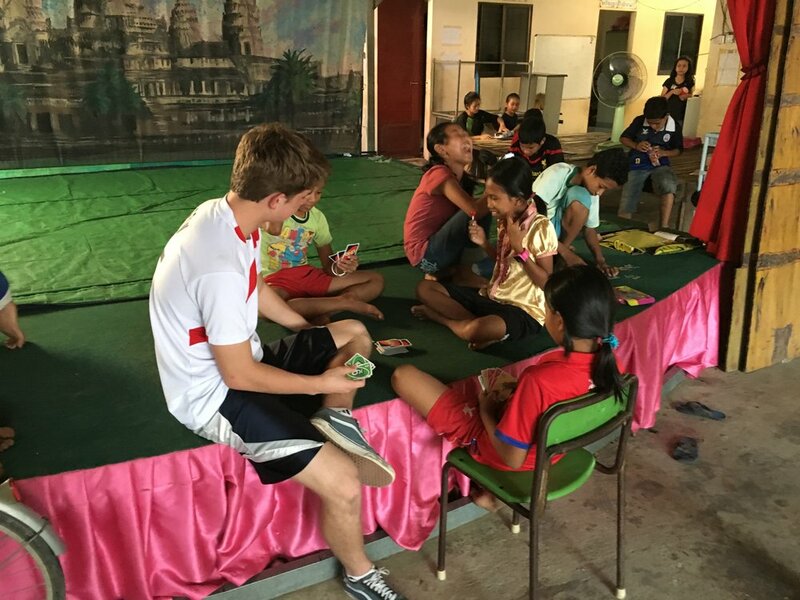 Andrew playing Uno with the local children. Making and selling bracelets is one way students pay for their school tuition. 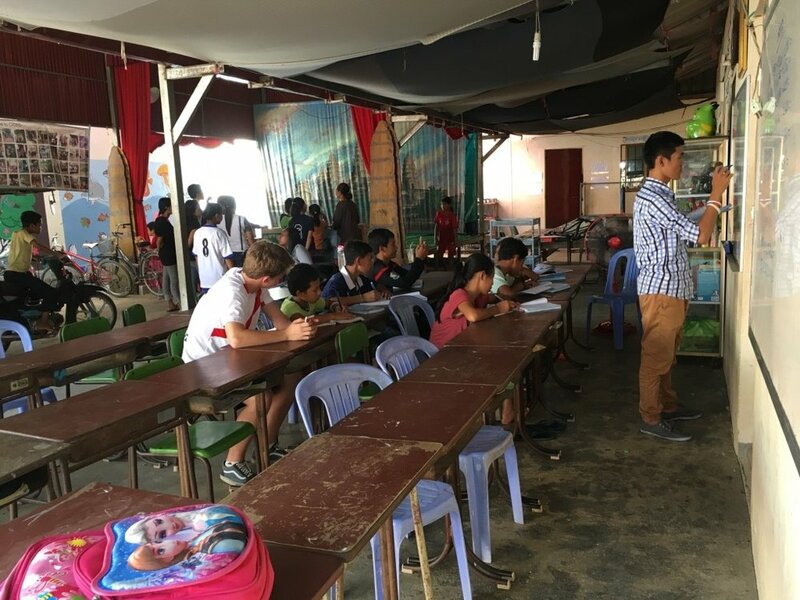 Andrew helping teach English to the local children. Working together to stuff backpacks full of school supplies. Setting up spikeball! Andrew and the kids had a blast playing together. They spent a week staying with the CICFO family. They worked with Kea Botevy, the head of the home, to tackle projects that would improve the children’s living conditions. Dr. Tadje and his son bought some mattresses for the kids to sleep on and installed fans to help with the intense heat and humidity. The Tadjes were able to create a safer living space by covering exposed wires. They read with the kids and played ball with them. Dr. Tadje was impressed with these amazing, impoverished children. In spite of their circumstances, they are happy and optimistic about life. They are content. They look out for one another and work together to provide a safe and peaceful space to exist and grow. Dr. Tadje was grateful for the opportunity he had to help and learn from the CICFO family. Nicole Eaton, therapist, mom of 2, biker, traveler, and sculptor, is always on board to try something new. One of her most recent endeavors has been learning to weld. Her social work practice keeps her busy, but in her spare time she has discovered she loves to create metal sculptures. She has even been able to sell some of her work at a gallery in Coeur d'Alene. Last year, her husband took her skydiving for her birthday. It was exhilarating! In her head, she was going to land in a graceful run, like in a movie. But it didn’t quite turn out that way. When she came down, she put her feet out and impacted hard. She couldn’t catch her feet under her and she couldn’t stop. She and the tandem skydiver on her back dragged along the ground and fell into a heap. “It wasn’t pretty!” she said. It was immediately apparent that her ankle was broken. The doctors in the emergency room knew she would need surgery, but her ankle needed to be set in the meantime. The Emergency Room Physician attempted to reduce her ankle but had a difficult time. She followed up with Dr. Tadje several days later. Due to the severity and instability of her ankle fracture, Dr. Tadje felt that Nicole needed surgery ASAP. She came in 2 days later and Dr. Tadje fixed her ankle with 2 plates and 9 screws. And most importantly to her, he preserved her brand-new Idaho tattoo. On a check-up visit, Nicole mentioned that she needed to heal quickly so she could get back to her creations in the welding shop. In the following conversation, Dr. Tadje offered her a box of medical hardware, and she offered to make him a sculpture out of it. 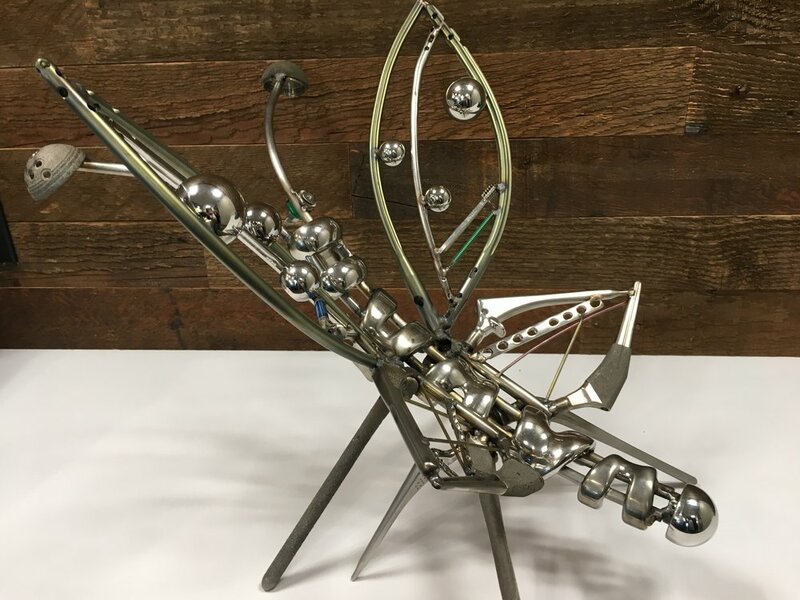 After exploring different possibilities, she came up with an amazing sculpture that symbolizes the work that Dr. Tadje’s staff aims to do each day. A butterfly, something beautiful and new created out of worn and unusable parts. Dr. Tadje and his staff are happy to be able to admire this work of art in their office every day. Ray Bingham turned 80 on New Year’s Day 2018, but he is not old. According to him, age is more about attitude than a number. Sometimes his body gives him some trouble, but he just stops by Dr. Tadje’s office for a little help and he’s off on his way again. He’s had a full and busy life working hard as a cabinet maker to provide for his large family. At 80, life has hardly slowed down for Ray. Whether it’s spending time with grandkids, working on his sprinkler system, or remodeling his house, Ray keeps his plate full. He’s had an amazing life, and the last couple of years have brought more adventure than Ray had ever expected. About 16 years ago, he was on an LDS mission in Australia. One day, he visited a family who had recently been on a vacation to the Philippines. They asked if he would like to see some pictures of their trip. Part way through the presentation, he saw a picture of an extremely skinny young girl who had a terrible cleft palate. The image struck him so powerfully, he instantly knew he needed to help her. He found out her name was Genalyn Amar, she was about 11 years old, and she lived on a remote island in the Philippines. He contacted LDS Social Services, who referred him to the Mabuhay Deseret Foundation. This foundation is located in Manila, and is dedicated to helping people in the Philippines with birth defects. Genalyn’s family lived in absolute poverty, so every need had to be carefully addressed and provided for. Ray was determined to do whatever it took to help this little girl. He made all of the arrangements so Genalyn and her mom could travel to Manila for the surgery. When they arrived, Genalyn was very ill. She was malnourished, anemic, and had tuberculosis. It took the doctors several months to get her healthy enough for her cleft palate surgery. Ray sent her a teddy bear to keep her company during her long hospital stay. He stayed informed of Genalyn’s progress through the foundation administrator. He was relieved and pleased when she made it safely through the entire process and was able to return home to her family. Many years passed and Ray still thought about Genalyn. He decided if he was going to meet her, he needed to make it happen soon. He wasn’t sure how to find her, but he searched through his things and found an address he thought might work. He wrote her a letter, asking if she remembered him and told her he would love to meet her. Six weeks later he got an email from Genalyn saying that she would love to meet him too. After he had booked his ticket, he was able to connect with Genalyn through video chat. At first, she held up a teddy bear in front of her face. She asked through her sister, who was translating, if he remembered the teddy bear he had sent her during her hospital stay. When she removed it, Ray saw that she only had 1 protruding tooth left and he wept. During their conversation, he found out that Genalyn’s 3 year old daughter, Abby, was also born with a cleft palate. He decided he wanted to help them both while he was in the Philippines. Genalyn, two of her sisters, and Abby met Ray at the Manila airport. Meeting them in person for the first time left Ray completely overcome with emotion. They were such beautiful people who had suffered so much in life, yet they were happy. He felt drawn to them and they made an instant connection. He immediately became their “Uncle Ray.” Before traveling to their home on the island of Mindoro, he wanted to start the process for Abby’s surgery. They took her to a clinic that was referred to them by the Mabuhay Deseret Foundation. 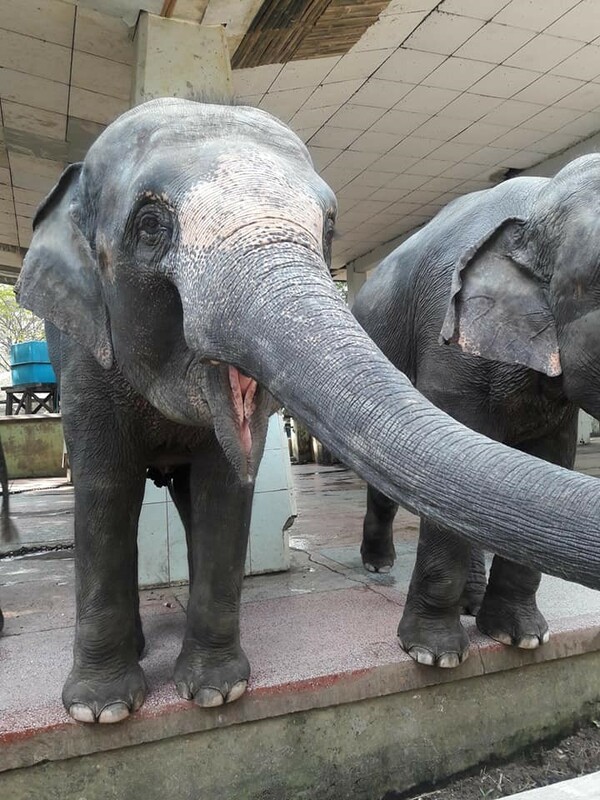 They found that she had pneumonia and worms, and would need at least one week of medication before she would be ready for surgery. They gathered the medications she needed and decided to treat her at home. Ray was able to stay in the Amar family’s humble home. He was amazed that in spite of having little food and few opportunities, they were so happy. They treated him like a king, sharing their sparse food with him, and insisting he eat first at every meal. While he was there, he met Genalyn’s parents, siblings, and some neighbors. He was overwhelmed at all of the poverty and intense need. He started forming plans for how he could help. Ray’s first goal was to get Abby’s cleft palate surgery done, which the foundation’s doctors performed right after he returned home. The next thing was to help Genalyn with her teeth. Before leaving for home, he arranged with the foundation to do her dental work. After 4 months, Genalyn had functional teeth and a beautiful smile. She had never been to school because of how badly she was tormented, and can neither read nor write. But now she feels like she has been given the world, because Ray has made it possible for Abby to have those opportunities she never had. After getting back home, he started tackling some of his other goals. All of Genalyn’s sisters had serious dental needs. Last March, he traveled back to the Philippines and was able to arrange for them and some of their neighbors to get their dental work done as well. He was also able to help with some groceries, school supplies, shoes, and some other basic needs. When Ray goes back in November, he has more goals to accomplish. On the top of his list is to help one of Genalyn’s neighbors, a 14 year old boy whose feet were badly burned and have turned under. Ray has been working to line up plastic and orthopedic surgeons to do the necessary surgeries for this young boy, and can’t wait to see how life opens back up for him. Ray knows he can’t do everything, but he is determined to do something. He’s changing lives one goal at a time. He’s full of gratitude that he’s able to be Uncle Ray to Genalyn and her family. He’s grateful for the connections, the miracles, and the opportunities that have opened up to him. At this point, he plans to just keep on running as long as he can. Because at 80 years young, he still has a lot to give. Why do you work with Dr. Tadje and his team? My name is Steve and I am Tadje Orthopaedic's x-ray technologist. As an x-ray tech, I take images of a variety of patient's, including new patients, re-check patients, post-op patients, etc. I have been with the Tadje Ortho team for approximately 2.5 years. My first job out of school was as an x-ray tech for West Boise Radiology, which was an outpatient radiology clinic. I then became a tech for bedside x-ray for about 3 years. After this job, I began working in the orthopedic field and took a job with Orthopedic Associates. I continued my orthopedic experience by working with Dr. Moss and Dr. Naeve, which eventually turned into a job with St. Luke's. After Dr. Moss and Dr. Naeve retired, St. Luke's placed me as an x-ray tech for Dr. Tadje. Working with Dr. Tadje has been both rewarding and challenging. He sees a wide variety of patients and runs a busy clinic, which has been a new experience for me. I enjoy getting to meet patients of all ages. I have adapted my skills to meet the specific requirements of our clinic. Coming to work with Dr. Tadje and his team has been a refreshing change. I enjoy working with the tight-knit group and smaller clinic we have created. Many patients have expressed to me that our team-based atmosphere has made an impression on them and has made their experience with us more "comfortable." I am proud to work for an office that values both its patients and employees. I am also appreciative of all the "little" things that Dr. Tadje does to show his appreciation for our staff members and the work that we do. In January, my husband and I traveled to Thailand as a part of the Trauma and Emergency Management Program. This program provides training, support and essential medical supplies to mobile, community-based “backpack” medics. The “backpack” medics hike through difficult terrain to deliver lifesaving emergency care to people in remote, landmine-contaminated areas of eastern Myanmar (Burma). On the plane from San Francisco, California to Bejing, China. Our Journey began on January 24th, 2018. We flew from Salt Lake City, Utah to San Francisco, California then to Beijing, China. After a 24-hour layover in China, we finally flew to Yangon, Myanmar (Burma) to begin training. 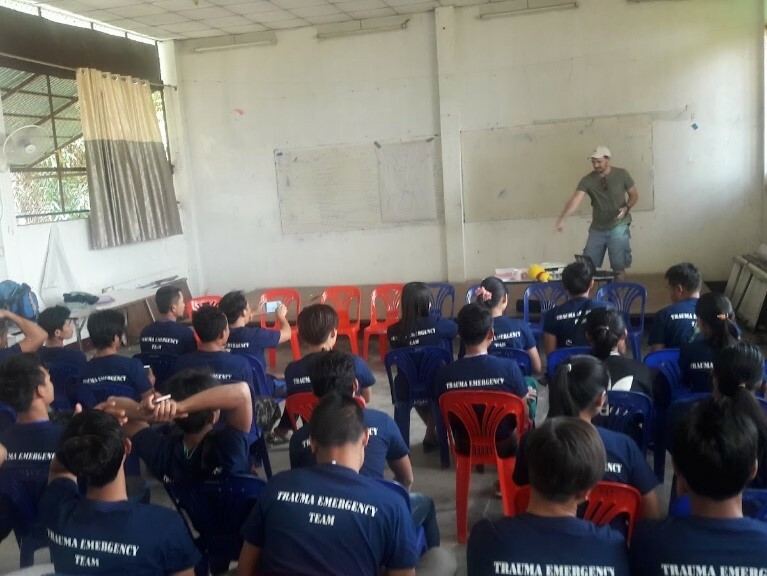 The initial trauma training was supposed to take place in Burma, however due to political instability in the region, the training was moved to Mae Sot, Thailand. Since my husband and I were already in Burma, we decided to stay and explore the city. The training took place in Western Thailand, in a district called Mae Sot (see border of Thailand and Myanmar). While in Burma, we stayed at the Hotel Kan Yeik Thar, located in Inya Lake. Hotel Kan Yeik is approximately 15 minutes from the Yangon International Airport. From there, we toured the city on foot and via Uber/taxi. We visited the Yangon Zoo, Inya Lake, and the Shwedagon Pagoda. This beautiful landmark (shown below) is a stupa or dome shaped structure. The stupa houses Buddhist relics and gives the people of Myanmar a place to worship. We toured the pagoda with an English-speaking tour guide, took photos and loved learning about its history. We left Yangon on Sunday, January 28th. We flew to Mae Sot, Thailand to meet the rest of the TEMP team. There were 7 team members which included 4 trauma/ER doctors, and an RN. The training began on Monday, January 29th. While in Mae Sot we stayed at the J2 hotel. The J2 was our home for 7 days while we attended the training. The length of the training was 6 days. It took place in a classroom located next to a now abandoned hospital. The “compound”, as they called it, was now used to house the students while they attended training. Each member of our team was assigned specific subjects that were used to teach the medics. Some of the subjects included: Anatomy & Physiology, Limb Injury/Amputation, starting IV’s and pregnancy and childbirth. Bryan and I were given fracture/dislocation, splinting and bleeding management. We also assisted with a “jungle operating room” which included the pig lab. On this day we studied and taught anatomy using pigs from a local farmer. We started each day with an activity or “ice breaker”. Since the students did not speak English, it was a good way for all of us to get to know each other without having to use the translators. One morning Bryan and I decided to teach them the Macarena! Some of our responsibilities during training included making and building models for the medics to use in class. We used sugar cane and paper towels for the fasciotomies and nebulizer tubing, as well as gloves for tracheotomies. For the abscess lab, we used sponges and strawberry yogurt. Although the training took up a lot of our time, we spent most of our evenings trying out the local cuisine with the rest of the team. Family style is how they do things in Thailand, and boy, did we eat! We met so many wonderful people and learned so much while on our trip. But after almost 2 weeks we were ready to go home and share our experiences with friends and family. We hope to someday return to Thailand! Tina Fitzgerald used to be a medtech. But in 2013, one of her patients accidentally parked an electric wheelchair on top of her right foot. It took 6 people to finally remove the chair. Her foot had been completely crushed. Her active, outdoorsy lifestyle came to a screeching halt. She found a doctor who performed and failed 2 foot surgeries. She was left unable to work, with daily pain and a foot that hardly functioned. Fast-forward to Christmas day, 2016. Tina and her husband were heading into a friend’s house to celebrate, when Tina slipped on some black ice. She fell hard on her left hip and hit her head on the side of the house. She woke up a few moments later in terrible, nauseating pain. But it was Christmas and she was embarrassed about the fall, so she decided to just keep the pain to herself. Days went by and the pain didn’t improve. She thought maybe it was her bulging disk acting up. She took ibuprofen, but nothing helped. No matter what she did, it felt like she was being stabbed in the groin. She couldn’t walk up stairs, she couldn’t get into a car, she couldn’t dress herself, she couldn’t push her handicapped dog in his stroller. Going anywhere was excruciating. It even hurt to lie down. She was used to limitations because of her foot, but this was beyond anything she had experienced. 6 months went by and she kept hoping for relief, but the pain was actually getting worse. She needed answers. Now. She went into her spine doctor, who gave her a spine injection, but it didn’t help. One day, she thought maybe a bath would bring some relief. But when she couldn’t get out by herself, she told her husband she had to go see a pain manager right away. The doctor did an X-ray of her back and ordered an MRI. The MRI came back normal, but Tina and her husband knew with absolute surety that something was wrong. They kept trying to find someone to help, but no one would listen. One day when she stood on her tip toes to put a coffee mug on the top shelf, she felt a distinct and painful separation in her hip. Her foot felt like it was 100 lbs. That was the last straw. She went to ER, but they wouldn’t do another MRI since her last one had been normal. Tina and her husband were beyond frustrated. They were desperate for answers and a reprieve from the constant pain. Her spine doctor agreed to order another MRI, this one for her leg instead of her back. They weren’t even home before they received a phone call that she had a fracture in the neck of her femur. Tina’s husband had been seeing Dr. Tadje for some issues with his shoulder, and really liked him. He called to find out if Dr. Tadje treated femur fractures. They found out he does! Happy day! They talked to Teia, the office manager, and told her their situation. She consulted Dr. Tadje, and he agreed to perform surgery for Tina the next morning. Finally, someone who would listen and agree to help! At that point, she had been coping with her fractured hip for 9 months. Tina met Dr. Tadje the next morning before the surgery. Because of the 2 failed foot surgeries in her past, she was terrified of a bad outcome. Dr. Tadje reassured her that he had spent time the night before researching the best method to treat her fracture. She was within inches of needing a full hip replacement, but since she had a small portion of bone still intact on one side, he would be able to attach some screws so her natural bone could heal. And best of all, he was able to find a way to make her hip immediately weight bearing. She had been expecting to be confined to a wheelchair for 6 months, so this was very good news. When she woke up after the surgery, she was surprised and excited to find that the pain was gone! No more stabbing. After one night in the hospital and some training from a physical therapist, she was up and moving with her walker. It was a miracle! A complete turnaround within a day! Now, a few months later, her limitations from this injury are non-existent, and her quality of life is markedly better. She only wishes she would have known about her “rockstar,” Dr. Tadje, for her foot surgeries. Dr. Tadje has given Tina her life back, and she’s excited to live it to the fullest. It all started in 2007, when I moved from Reno, Nevada, to the great state of Idaho, to be closer to my Grandparents. I was blessed enough to quickly land a job as a Certified Nursing Assistant at St. Alphonsus in Boise on the Orthopaedic Trauma floor. While I had been a CNA on an Orthopaedic joint replacement floor in Nevada, the difference in care, medical procedures and technology was astounding. I had never been exposed to Orthopaedic trauma before and I quickly grew to love it. Through the five years I worked for St. Alphonsus, I got to know many different Orthopaedic surgeons. While they were all wonderful and skilled, one really stood out to me – Dr. Tadje. He was so kind and compassionate, and it was evident by watching the way he interacted with patients that he not only had a true passion for his work but also for helping others. While there are so many different stories I could tell (read Coltin’s Story below), I remember one in particular. I was working with a patient that had been critically injured in a motorcycle accident when Dr. Tadje happened to stop by to check on him. The patient had a head injury, multiple fractures and a long list of internal injuries. Although the accident happened almost a week prior, it was the first time the patient had been able to meet Dr. Tadje because he had been unconscious. Dr. Tadje shook his hand, pulled up a chair and sat down next to the patient, which was something I’d never seen any doctor do before. He talked with the patient for quite some time, detailing the multiple injuries he sustained, how he had treated each injury and what the patient should expect as a result. Dr. Tadje and the patient continued to talk about “normal life” things – family, kids, work and hobbies. Before leaving, the patient thanked Dr. Tadje for “putting me back together.” Dr. Tadje promised him that he would do his very best to care for him so that he could get back to playing with his kids. Once Dr. Tadje left, the patient looked at me and said, “I think he really means that.” After watching Dr. Tadje interact with the patient I was able to confidently say “I know he does.” From that moment forward, I knew Dr. Tadje was not only a skilled surgeon, but also as a kind, caring and uniquely compassionate person. Over the next several years I completed a bachelor’s degree in Health Science Studies and was lucky enough to continue to work with Dr. Tadje on the Orthopaedic floor at St. Luke’s. A little over two years ago Dr. Tadje asked me to join his team. After doing inpatient orthopaedics for over 10 years, leaving the hospital was the hardest decision I’ve ever made, but I knew I couldn’t turn it down. I had always thought of Dr. Tadje as top-notch, and while I expected his team to be as well, I’m still surprised and amazed at how awesome they are. Virginia is so thoughtful and deeply cares about her patients, many of whom she knows on a nearly personal level. Tracy is all about making sure every patient is taken care of. Mikayla is detailed and on the path to become a PA. Steve, has years of experience as an x-ray tech and enjoys talking with our patients. Lacey, our newest team member, has a heart of gold and fits right in. Each day I go home knowing that every person I work with genuinely cares about our patients, not just for them. In addition to working with an amazing crew, I also get the opportunity to know our patients over time and to watch as they improve. Whether it’s a work-related injury, a fracture or a condition earned after years of having fun, I know that our patients are going to get the best treatment in a kind and caring atmosphere. For me, the best thing about being a part of Team Tadje is watching our patients get back to doing the things they love. Hello Everyone! Thank you for taking the time to read up on who this new girl really is! My name is Lacey Madrigal. I am part of Team Tadje’s Medical Billing. I address each day with sincere actions to build financially positive and OPEN relationships with our patients. I have worked inside the medical world well over 10 years now, feels weird saying that…. wasn’t I a free-spirited young adult just yesterday? Over the years I have absorbed many experiences working alongside of physician’s, nurses, reception, administration. I am proud to have built wonderful relationships with these professionals. It is through this experience I have hand-picked the tools and the understanding of what it takes to have a unified medical practice, one that works conscientiously to create the very best experience for its patients. Unity inside a practice shines bright and I see this intention working at Tadje Orthopaedics. I am a mother, wife, daughter, sister, aunt……family means everything to me! My husband and I have 10 + years of memories together, 5 years of which we have been married. My son is 3 years old, wild and softhearted. My 1-year old baby girl is so sweet, with a mellow temperament. She is ready to take on the world! Motherhood has been life changing - I'm sure all you mothers out there are smiling under your breath! I am blessed to have my babies. They challenge me and teach me, just as I challenge and teach them growth. I hope to raise them with poise, honor, and kindness - just as my parents have raised me. I am a lover of the Arts. Performing Arts – music, dance, theater. Moved by visual arts. Designing creating, decorating, finding the next treasure to distress/shabby chic! I enjoy Yoga! I always look forward to spending time with my parents, brothers and sisters, nephews and nieces, friends! But I also love to just have a night in with a good movie. If you should ever find yourself searching for Orthopedic specialists, I highly recommend us! I have only been employed for 5 short months and already have formed this impression. In addition, if I have already experienced working with you through your orthopedic recovery, I thank you for trusting us. Wife, mom, daughter, friend, and Licensed Practical Nurse for Team Tadje for over 5 years! These are just a few of the many roles I play. My name is Tracy Tew. My story began in Fullerton, California. Warm sunny days and flip flops were some of my most favorite things, that is, until I met my husband who is an Idaho native. Although on most days you will still find me wearing flip flops, the ever-changing Idaho weather has definitely grown on me. I attended Idaho State University for my nursing degree. And after working in corrections for 5 years after graduating, Orthopedics was a welcome change. My husband and I have been married for 14 years and we have twin 6-year-old boys and an 18-year-old daughter. We enjoy camping, spending time with family and traveling. My position at Tadje Orthopaedics is multifaceted and keeps me on my toes. From patient care to insurance verification, I have grown to love what I do and the people I work with. In addition to sports medicine, trauma and joint replacement, Dr. Tadje has an interest in international humanitarian work. He has traveled to Costa Rica, Dominican Republic, Nepal and Thailand to participate in surgical missions. Dr. Tadje has shared this interest with my husband and I, and thanks in part to his generosity, we have recently been chosen to participate in the 2018 Trauma and Emergency Management Program in Kawkareik, Myanmar (previously Burma). This will be the first of what we hope to be many international trips. I believe this experience will not only help others, but it will help us to grow both personally and professionally. Keep an eye out for my next blog all about our trip. The first week of November, I had the opportunity to journey to Dallas, Texas and attend the 2017 AAHKS (American Association for Hip and Knee Surgeons) annual meeting. I spent 2 solid days listening to papers and symposiums, selected from over 1400 submitted, to be reviewed at the annual AAHKS meeting. Topics covered ranged from antibiotic coverage, to surgical technique, how to increase patient outcomes and avoid patient complications. In addition to the talks presented, there was a large exhibit hall with vendors demonstrating everything from surgical implants to positioning devices and products to aid in patient care. I was also able to visit with and discuss processes with other orthopedic providers. It was a great learning experience and I look forward to bringing back to our practice the new evidence based recommendations and assisting to implement them at Tadje Orthopaedics. My name is Mikayla and I am Virginia and Dr. Tadje’s medical scribe. As a medical scribe, I accompany Dr. Tadje and Virginia as they see patients and dictate their notes for them. I detail the history of the injury, hands-on exam, imaging reads, and treatment plan. I have been with the Tadje Ortho team for about 8 months, and let me tell you, it was the best decision I have ever made. My medical field journey began with working as a CNA. I had worked in both skilled nursing and assisted living facilities in high school and college, so upon graduation, I was ready for a new and exciting challenge. I began working at St. Luke’s as a Unit Clerk/CNA on the orthopedic/ENT medical/surgical floor. This is where I met Dr. Tadje. He rounded on several of our patients as an orthopedic hospitalist. He was always a doctor that stood out to me, because no matter who you were, he always made it a point to say hi or good morning. He seemed like a genuine person and it showed in how he cared for his patients. One day, Dr. Tadje contacted me and asked me to join his team. While I was completely surprised and overwhelmed, I was excited for the opportunity to work with Dr. Tadje and to meet his team that he spoke so highly about. Little did I know, his team was even better than I could have imagined. They welcomed me with open arms and have taught me so much. Since joining Team Tadje, I have encountered countless experiences that have shaped my future in the medical field. While Dr. Tadje is my boss, he and Virginia both are concerned about ME, as a person too, which is nearly impossible to find in the workforce anymore. While I strive to be a good employee, Dr. Tadje and Virginia are both supportive of my long-term goals in the medical field. I am currently undergoing the PA school application process. Dr. Tadje has allowed me to shadow him in the operating room and Virginia teaches me new things in clinic such as exams, injection techniques, and how to read x-rays. They both are role models to the caring and invested provider that I aspire to be someday. Steve, our x-ray tech, has taught me several x-ray techniques in his spare time. Tracy, our nurse, has taught me how to authorize and order MRI’s, take medical histories on patients, draw up injections, cut casts off, and remove staples and stitches. Teia and Lacey have taught me about our EMR and insurance coverages. All of these aspects are things I would have never learned without coming here. Until now, I had always worked at a “job.” Now, I genuinely look forward to coming into work. I get to work with amazing people and learn while doing it, what more could I ask for? I love working with a team that is dedicated to their patients and that puts patients first. And while I may not be with the Tadje Ortho team forever, I will forever remember them and what they have done for me. Coltin Steele grew up in Eagle, Idaho as a confident, tough farm boy with a large supportive family. In June 2010, life became especially busy for him. He was working hard mowing fields and preparing for his upcoming wedding. The day before his wedding, his time was already filled with last minute preparations when his friend asked him to take over a mowing job for him. Coltin agreed, but felt quite rushed. Instantly, he started making phone calls. The phone call to his father was particularly distressing as the shock of what had just happened began to sink in. His family, along with his fiancé, Candice, and her family rushed to meet him at the hospital. When he arrived at the ER, the on-call doctor immediately assessed him and determined that his foot was not salvageable. The doctor started preparing to amputate Coltin’s leg up to his knee. His family was devastated. They promptly decided to do whatever was in their power to avoid that outcome. They knew Dr. Tadje personally, so they started trying to track him down. Dr. Tadje was headed out of town with his family, but as soon as he heard about Coltin’s predicament, he rushed into the hospital to see what he could to. Dr. Tadje promptly took over Coltin’s care, and much to the family’s relief, had a more hopeful prognosis. He pledged that he would do everything in his power to save Coltin’s foot. Though there was no guarantee that the surgery would be successful, the skin would survive, or the foot could be functional in the future, he promised to try. Coltin’s family was overwhelmed with gratitude, and decided that anything was better than amputation. They decided to move forward with a reconstructive surgery, remaining full of cautious optimism. Dr. Tadje expertly handled the long surgery, and was able to successfully piece Coltin’s foot back together despite how badly it had been mangled. For weeks, Dr. Tadje nursed Coltin’s foot and little by little it started to heal. The process was long, painful, and traumatizing for both Coltin and his family. He had been knocked down and his confidence was tried. However, he clung to positive thoughts like a lifeline. Incredibly, he and Candice were able to get married just 3 months later. His healing process was far from over, but the worst was behind him. Within a year, he was selling security systems door to door. This job required him to walk all day. At first, his foot ached so badly he could hardly cope. But gradually it became stronger. Not long after, he was able to return to sport and enjoy his favorite activities again. Though in the beginning he took some guff for an embarrassing wipe out on the indoor soccer field, no one ever knew he had a compromised foot. He and his wife now enjoy a wonderful life together. Coltin has graduated from Boise State and has a great job. He and his wife have twin toddler girls who keep them very busy. They are grateful to Dr. Tadje who opened doors that were threatening to close. They are grateful for the willingness to try and save what had been deemed unsalvageable. Coltin can’t claim to have a beautiful foot, but he has a fully functional foot that allows him to live life to the fullest. And for that, he is incredibly thankful. Why do you work with Dr. Tadje? Although there are many reasons I work with Dr. Tadje, one of the main factors in my decision to work at his practice is his dedication to his patients. When I was getting my master’s degree, I was working at St. Alphonsus as a charge nurse in the Operating Room. Any time there was a level-1 trauma case admitted, they were sent directly to the emergency room. One night, a patient with a level-1 trauma injury to his foot was admitted, and I was paged down to the ER. The patient was in his early 20’s, and his foot had been run over by a commercial lawnmower. This was a very significant injury, and his foot was in really bad condition. On top of that, I found out from some of the other nurses that the patient was going to be getting married within the next couple of days. The orthopedic surgeon who was working in the ER looked at the patient’s x-rays, and determined that the foot wasn’t salvageable, so it, as well as part of his leg, would need to be amputated. When they informed me of this decision, I was so upset because this poor young man was going to lose his foot the day before his wedding. We all felt badly for him, but there didn’t seem to be anything we could do. Within 15-20 minutes of hearing that he would be losing his leg, I got a call from Dr. Tadje telling us that he was going to come to the ER to try to save the patient’s foot. It turns out that the patient’s family were close friends of Dr. Tadje's, so they had called and asked if there was anything he could do. Dr. Tadje and his family were on their way out of town for a vacation when he received the call. They were on the highway heading out of town, but Dr. Tadje decided to postpone the vacation and head to the ER to help his friend. He showed up at the ER and promptly took the patient to the operating room for surgery. Although it was difficult, he ended up saving the patient’s foot. It’s not a pretty foot, but at least he didn’t have to undergo an amputation. To this day, he is still walking around with a fully functional foot. I felt inspired that Dr. Tadje would put his vacation on hold to help a friend and patient. Seeing his dedication showed that he truly cares about his patients and his practice. I knew I wanted to work with someone who is so committed to putting patients first, which is something I value as well. The good news: I got to spend Christmas Eve 2016 with my family while I was visiting Idaho. The less good news: We had to spend it in the emergency room. About 8:00 pm that night, I was in an accident that left me with a fractured fibula and a fully ruptured quad tendon in my left leg. If any of you were around during the winter of 2016, you’ll remember it was (not so affectionately) referred to as, “Snow-mageddon.” Credit that—and a little clumsiness on my part—for my adventurous holiday. And indeed he was. I didn’t get to actually meet him until two days later right before my scheduled surgeries—one to pin the ankle, and the other to repair the badly damaged quad tendon. When Dr. Tadje entered the pre-op room, I liked him immediately. He greeted me with a confident smile. I could tell he was smart and knew his stuff by the way he talked to me about the procedures I was about to undergo. But he was also smart without making me feel dumb (I work in marketing—medicine is a bit of a mystery to me). That made me feel a lot more comfortable since he left me with a good idea of what he was going to do, and what I’d be facing in terms of recovery and physical therapy (PT) over the next several months. The surgery went well and was very successful. I went home that evening and all things considered, felt pretty good. But, I’m not gonna lie—once the anesthesia block wore off, the pain set in with a vengeance. Dr. Tadje had been kind enough to give me his private line, and while I knew he was headed out for his own Christmas holiday with his family, I texted him anyway out of sheer desperation. He responded immediately and gave me a supplemental drug for the pain. I don’t think I’ve ever had a doc respond so quickly—certainly not over the Christmas holiday. That first 48 hours was pretty rough—but I felt equipped to deal with it since Dr. Tadje had told what to expect, and he’d made himself available to help out. Facing those hours alone and without a doc who had not only informed me but made me feel like he was by my side, would have made it a pretty scary experience. But I never felt like I had to do this alone—Dr. Tadje was right there if I needed him. As the weeks progressed, I returned to California and my ankle healed well. Mine was a super complicated situation given both injuries (in fact, in the literally hundreds of hours I’ve spent on the web researching them I’ve never encountered someone who experienced both on the same leg at the same time), so it would be misleading to say it was a cake walk. And, it’s not exactly comforting to google your injury and have virtually every orthopedic website describe it with terms like “devastating” and “severely disabling,” so that—combined with Dr. Tadje being very honest with me about my recovery—helped me understand this would be a challenge. Dr. Tadje stayed in touch even after I went back to California, and proactively reached out to me to see how things were progressing. While the news for the ankle was good—it was a bit less so for the quad repair. One of the things that’s required to heal the quad repair correctly is vigorous PT, and because of the ankle break I was unable to do much of what was required to work on the quad repair. As a result, my knee built up a lot of scar tissue and flexion became an issue—due only to the complex nature of trying to deal with both injuries. In retrospect, I know we did the right thing by healing the ankle first so I could walk again and do the required PT for the knee. I was in a race against time, and given my body is one that builds scar tissue rapidly and in vast amounts, by the time the ankle was healed sufficiently my knee flexion was blocked by significant scar tissue build up. Despite my best efforts—and the best efforts of my awesome PT team in California, I became a candidate for a procedure known as “manipulation under anesthesia” or MUA. Because I’d been working so closely with Dr. Tadje—and because I liked and trusted him—I made the decision to come back to Boise to do the procedure. I’m slated to do that procedure in a little over a week, so my adventures with Dr. Tadje and his staff (who also rock, more about them in the next installment) will continue. I’ve also made the decision to remove the ankle hardware this fall—and will once again be working with Dr. Tadje on that, so there will be a part three to all of this. “Why don’t you just have those surgeries done in California?” Yes, I get asked that all the time. And the truth is, I certainly could—there is no shortage of qualified surgeons in my area. But it’s important to me to know that the doc operating on me knows my case, is skilled, and is personally invested in my success. That made the decision to fly back to see Dr. Tadje pretty easy—he’s got all three qualities in spades. I do have one complaint, though—it’s about the scar on my knee. All my female friends are envious because it’s healed so beautifully and is almost invisible. But hey, I’m a guy and after going through this adventure I wanted a gnarly war wound to show off as a badge of courage! But kidding aside, I think it’s a pretty cool testimony to his skill that I can emerge from a major surgery like this without looking like Dr. Frankenstein rebuilt my leg. Oh, and maybe the best piece of news—Dr. Tadje told me to expect a full recovery. That means a lot to me as a weightlifter. In fact, a month prior to the accident I hit a personal best on my Romanian Deadlifts (RDLs) , at 550 lbs. The gym and working out are really important to me, so hearing Dr. Tadje say the words, “You’re going to make a full recovery,” meant a lot. And the best part: I believe him. Sometimes it can be tough to find things to be grateful for when you’re facing an ortho injury—large or small. But I gotta admit, I’m sure grateful I drew Dr. Tadje’s card that night in the ER. He’s made my experience a lot less scary and painful—for me, at least, that’s a surgeon worth keeping.